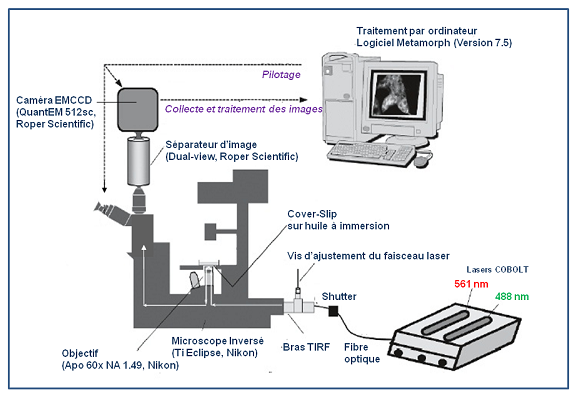 The platform has a NIKON mount for objective-based TIRF microscopy. 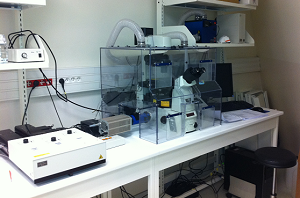 This system is installed on a fluorescence inverted microscope (Ti-Eclipse). The microscope has a temperature controlled chamber (Life Imaging Series) so samples can be preserved in physiological conditions. 1. An arm for the epifluorescence light and an arm for the evanescent wave light. This microscope has a PFS (Perfect Focus System) so it can maintain and automatically correct the adjustment of any drift. • Two 50mW Cobolt SLM (Single-Longitudinal Mode) lasers that excite the fluorescence at 488 nm and 560 nm. The Nikon TiE-Eclipse has a motorised lens turret for the fluorescence tubes to excite the fluorochromes. • CFI Apochromat 60X TIRF O.N. oil based 1.49 for total reflection of the laser beams. The oil based TIRF lens corrects spherical aberrations induced by temperature changes in the refractive index of the immersion oil. 3. A Photometrics EMCCD QuantEM 512SC (512×512 pixels; Roper Scientific) camera. This camera is mounted on a Photometrics Dual-View system (Roper Scientific). The Dual-View uses a single separator slide to divide light emission from a microscope into two independent channels. Each channel is then projected on half of the CCD sensor of the camera at the same time so that two fluorescence can be acquired simultaneously. 4. MetaMorph version 7.5 (Molecular Devices) monitoring and acquisition software.